Hats off to Labour, they have PR'd there way out of the crisis they faced just over a week ago relating to a downturn in the economy, losing the seat of Crewe and various other Golden Brown matters. How have they done this? 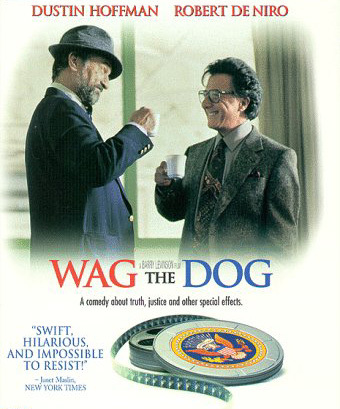 They have created a phoney war, just like the film Wag the Dog*. The Labour PR's have whipped up a storm over the 42 day holding period for terrorist's even though the vast majority of the population agree it should be done (>60% in national media poll's this week). Well done to the Labour PR machine. I wonder what the Tories can do to counter this, will be interesting to watch. A joint effort today, Bad PR for both the Royal Navy and Dolphins, supposedly one of the most intelligent creatures on this planet (The Dolphin, not the Navy). The Navy were apparently testing some missiles off the coast of Falmouth and it freaked some Dolphins out to the point where they ran themselves aground. The story is that one injured Dolphin caused all the others to dive in a rescue it, whereupon the Navy missiles startled them and they panicked. Pretty nasty thing to do on the part of the Navy, but then again, the Dolphins should have legged it out of there, or at least grabbed a white Seagull and waved it in the air as an act of surrender. *great film starring Robert DeNiro. The US Gov't fakes a war with a made up country to deflect media attention away from the fact the president had an affair. They even hire actors and have a war song to make the public believe it is all going on.